Even in milder climates, the winter months bring falling temperatures. And for Suddenly Solos in the northern part of the US, the leaves are falling fast and snow and ice are almost certainly on Mother Nature’s to-do list! So here are some easy, low-cost things we can do to help us motor through the winter relatively trouble-free. Have your battery checked. There is nothing more distressing than turning the ignition key and being met with that “click, click, click” of a solenoid. It always seems to happen when you try to start the car on a particularly frigid night when you are in the middle of nowhere! While it is on your mind, several auto parts chain stores offer free battery analysis (and free installation of a new battery). While the “red zone” for being concerned about an automobile battery is about after 4+ years, this can vary widely depending on usage conditions. You can help prolong your battery’s life by turning off high-draw items like headlights, A/C, etc. when shutting down so they don’t add to a starting load. Needless to say, if you are not using your car for a protracted length of time, think about a trickle charger. Check your tires. Look for uneven tread wear and depth. Colder weather changes the tire pressure readings so be prepared to add some air. 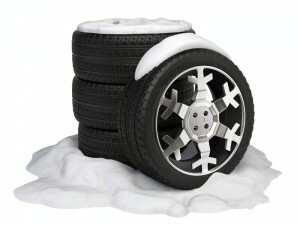 Mediocre tread on a tire can lead to big trouble in slushy, snowy conditions. If you live in a particularly snowy environment, definitely consider specialty tires. And remember, an all-wheel-drive vehicle may get you going and keep you going in winter weather, but it won’t help you stop any quicker, so be sure to allow extra stopping room. Wiper blades. I wouldn’t wait for tell-tale streaking to give you the replacement heads-up. Just put on a new set of blades (don’t forget the rear wipers) and relax. If they are over a year or so old, they are probably ready (or near ready) to be replaced anyway. Top up your washer fluid and keep any remainder in the bottle handy for refills in the months ahead. Lights out. Do a walk around your car with the engine running, all lights on and the hazards blinking. Check for dead bulbs and replace them. Wax on. Even with today’s superior paints and finishes, it can’t hurt to wash and wax your vehicle before things get really messy. I have had success with Rain-X windshield treatment (which I also apply to the head and tail-lights!) when I do my winter “detail.” Vacuum and clean the inside – women are very sensitive to the condition and smell of a car’s interior. They might give you a “pass” on a dirty exterior during the slushy winter, but not the interior!